Want to take full advantage of this season’s fresh produce? 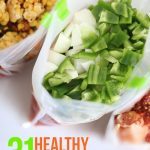 Simply combine in freezer bags and freeze for later! 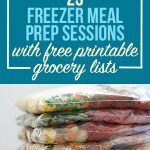 It only takes a few minutes to do and I’ve found so many fresh fruits and vegetables that freeze perfectly without any cooking ahead of time. Why freeze these fruits and veggies? You can stock up when they’re in season and save a lot of money. You can freeze what you have on-hand before it goes to waste. You’ll always have fresh food available so you don’t have to run out to the grocery store. I know some people blanch fruits and vegetables before freezing them, but when I’m freezing them for smoothies and soups I find they freeze perfectly without any cooking ahead of time. I’ve literally frozen thousands of foods this way and they always turn out great. The only problems I’ve run into are fresh potatoes and broccoli. Potatoes can turn brown in the freezer (these tips can help prevent that) and broccoli oxidizes and tastes gross (so I use frozen broccoli florets from the grocery store in my freezer meals instead). The USDA Food Safety and Inspection Service says that freezing food at 0°F (the standard freezer temp in the U.S.) helps keep its vitamins and nutrients, so frozen fruits and veggies are just as healthy as fresh ones. Yay! 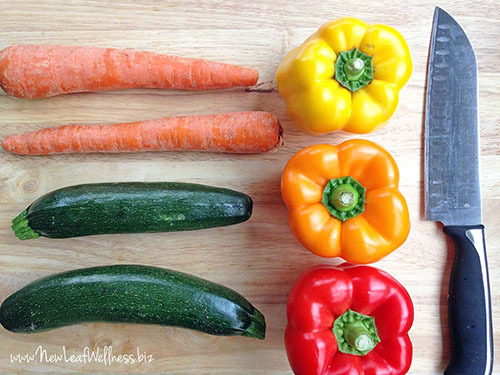 To freeze, peel and chop your veggies so you won’t have to do so when they’re a frozen block. 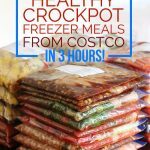 Place in a quart or gallon-sized plastic freezer bag in the freezer for up to three months. When ready to use, thaw or add directly to your recipe frozen. Can you think of other fruits and veggies to add to my list? Please share in a comment below! When freezing fruits and vegetables, it’s best to freeze the slices on a baking sheet, leaving room so they aren’t touching much. Then transfer the frozen fruits/veggies to a freezer ziploc bag. They don’t harden into a block this way, and you can use the amount you need. Would bananas turn brown taking them out of the peel? No. I freeze them for smoothies all the time. only if you leave them out before putting them into the freezer. they do go black if left in the peel in the freezer. Question about moisture. For the carrots, zucchini and other veggies–I’m assuming these are washed before freezing. 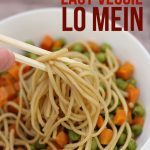 Any tips on how to get most moisture off of these veggies? For instance, I’ve tried green beans. Washed and patted dry and put into a ziplock with most of the air squeezed out–and they were very disappointing when I used. All mushy. I use a kitchen towel. I think how you use them after freezing is more important than liquid inside the bag. It was suggested to me to thaw them the same way, you spread the green beans out on a paper towel and let them thaw on the counter before eating or cooking them. I have tried this with the frozen green beans from Trader Joes, but haven’t tried freezing my own beans yet. Thank you SO much, Kelly, for this info!! I have LOTS of zucchini & summer squash from my daughter’s garden. I have been sharing with neighbors so they didn’t go bad. Which is fine, but now I can freeze some for later. One year I blanched them and they came out horrible, I think I cooked them too long. I do have a question….I love to make zucchini bread and zoodles….do you think I could grate them and zoodle them and then freeze to use when I have time to make bread or need zoodles?? Thank you!! I freeze Broccoli and potatoes all the time. I par boil the potatoes and pop them into zip lock bags in portions so I can just take out when I need them. The broccoli I blanch for a couple of mins plunge into cold water and put straight in zip lock bags and freeze, I cook/steam these from frozen. Mandie, thanks for the tips! Mandie, When you say, “you par boil the potatoes”… are the potatoes peeled, sliced, or quartered? How long do you par boil them for? Very interested in adding potatoes to my meals. Thanks!